1981. He pursued residency training in General Surgery at the University of Colorado and both Surgical Research and Surgical Oncology fellowships at the Memorial Sloan-Kettering Cancer Center. From 1989 to 1991 he was Assistant Professor in Residence at the University of California at San Francisco before moving to the Fox Chase Cancer Center in Philadelphia when presented with an opportunity to limit his practice to head and neck oncology. 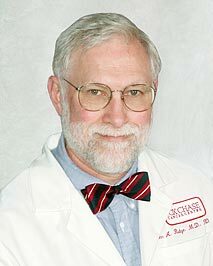 At Fox Chase, he became chief of the Head and Neck Surgery Section and joined the faculty of Temple University. Currently he holds appointments as Senior Member and Professor of Surgical Oncology and of Molecular and Translational Medicine at Fox Chase and as Professor of Surgery and of Otolaryngology-Head & Neck Surgery at Temple. He loves to teach. A surgical oncology fellowship position has been endowed in his name. Dr. Ridge has devoted his academic career to multidisciplinary treatment of head and neck cancer, with a strong commitment to clinical research. He has been influential in the design and execution of several clinical trials evaluating “organ preservation,” the non-surgical management of advanced squamous cancers of the head and neck. He served as Co-Chair of the Head and Neck Committee of the Eastern Cooperative Oncology Group and is a member of the Head and Neck Steering Committee of the Radiation Therapy Oncology Group. He has been a member of the NCCN Head and Neck and Thyroid panels since their inceptions and has been a writing member of both committees. Currently, he is Co-Chair of the NCI Previously Untreated and Locally Advanced Disease Task Force for the CTEP Head and Neck Steering Committee. He is a Governor of the American College of Surgeons. After they met at Sloan-Kettering, he married Elin Sigurdson in 1989. A prominent academic surgical oncologist interested primarily in colorectal cancer, she too works at the Fox Chase Cancer Center. Their son, Lukas, and twin daughters, Kelsey and Hannah, are in college. None of them show the slightest interest in medical or scientific careers. A fencer, Drew holds an “A” classification in Epee and competes internationally. He has been a member of two US Fencing Association Veteran World Championship Teams and has had respectable results on the World Cup circuit. Though he enjoys the Rockies, he fences much better than he skis. Active in many professional organizations, he was part of the first Council of the American Head and Neck Society.